With thanks to Jan’s neighbour for the cherries from her tree! 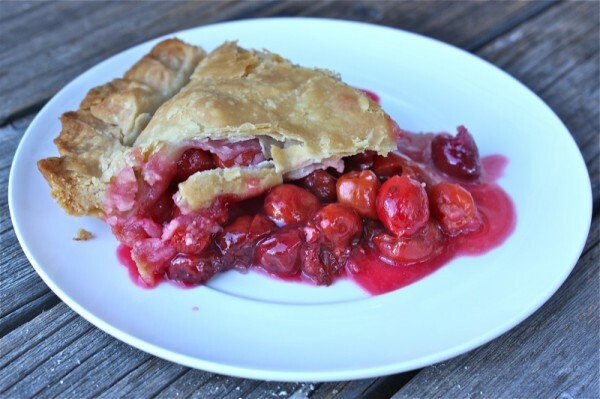 After a few hours of pitting cherries, the aroma of homemade cherry pie celebrated the half day of preserving sour cherries for the winter. When I was at the Slow Food Edmonton Canning Bee on Sunday, Jan, a past Taste Tripping cooking class participant attended with Su and heard that I was looking for a tree that needed picking. Ours is so pretty, but I harvested only half a bowl just after the canning bee. She told me she would call her neighbour whose tree was laden with perfect little jewels and see if she was going to pick them. I was at Jan’s at noon on Monday after her Sunday night text. Whoo-hoo! Free gorgeous cherries. How serendipitous is that? Social food events are so important for networking. Neighbourhoods used to be like that, but the front drive garage ended the comradery that used to exist amongst even non-parent communities. I was so tickled to have this generous offer! 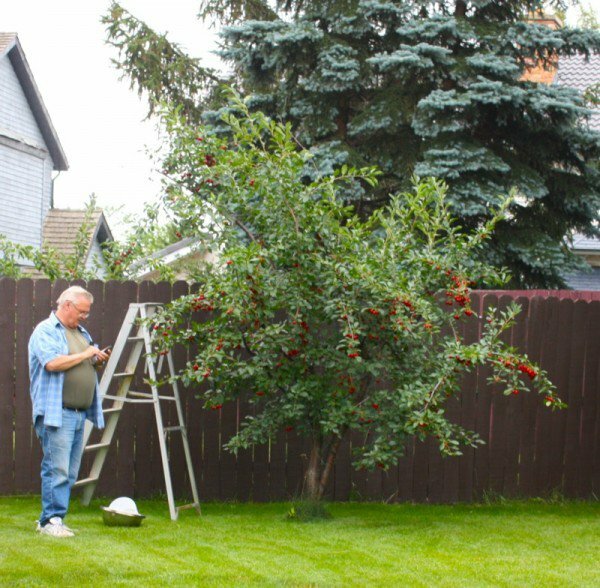 Not only that, but her husband, Ray, brought over his own ladder, and picked the top of the tree for me. I had great company, a lovely chat, and in thirty minutes we had stripped this tree of every single berry: carefully, of course! It looked laden, but when I got closer…. …I was agape at the abundant conglomeration of glistening translucent clusters festooning each branch. I had never seen a cherry tree so prolific. Mother Nature is definitely the Queen of creating exceptional and unexpected beauty that find myself deeply in awe of, often. Below is my cache. I placed my pickin’s in separate bowls so there was not too much pressure on the berries. There were four of theÂ biggest stainless steel kitchen bowls completely full. Fortunately, I had help pitting them. I lay parchment on a cookie sheet, and freeze them overnight, then place them into labelled zip-lock bags and return them to the freezer for future use. That is how I preserve most fruit. I can make jams or jellies or pies later when the harvest isn’t so busy, or when the season has passed. I kept the ones with stems separate to can in a very heavy sugar syrup; hoping to make chocolate cherries for the holidays with them. I also kept the “not perfectly pitted” ones separate to make the tasty chutney recipe from Johwanna. That will be another post! And then, the berries I brought back from my canning bee, pitted and ready for a pie, got put to good use! 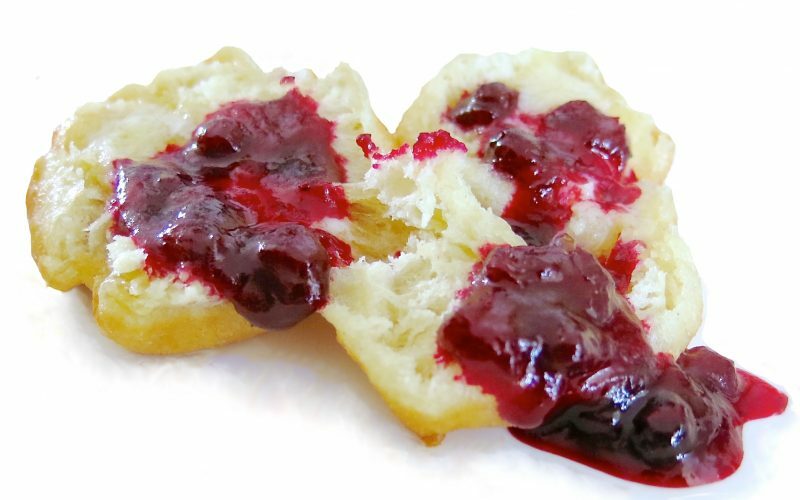 I had taken two discs of pastry out of the freezer the night before when I came home with the berries. 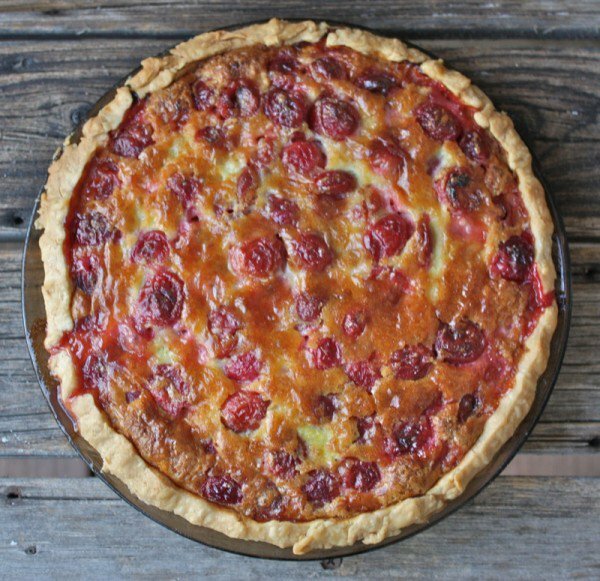 I added 2 1/2 full cups of sugar to the bowl of cherries that would fit into my pie with the zest of one lemon and 1/3 cup of cornstarch. 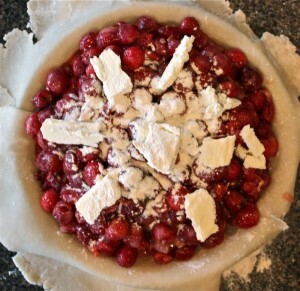 After filling the shell, I placed several daubs of butter on top of the cherries, and sprinkled a little more cornstarch over the top, covering with pastry and crimping the edges. 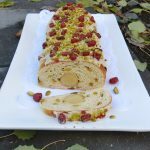 What to do with the pastry scraps and the 2 cups of extra berries? 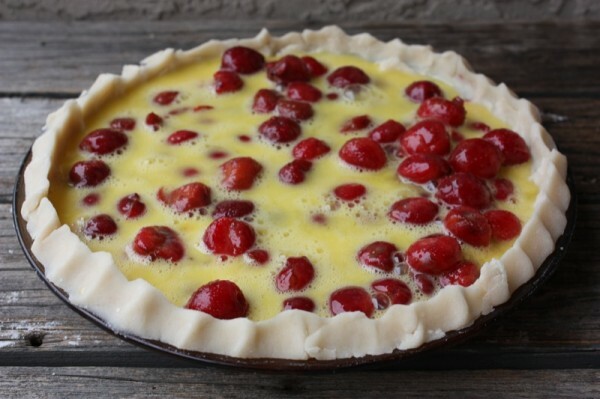 Cherry custard pie! Just enough pastry, and the perfect amount of berried with three whipped eggs and cream on top. 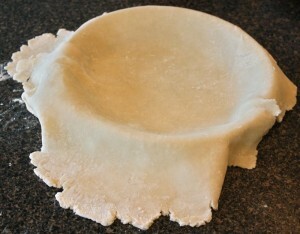 I didn’t sugar this crust on purpose. I could have even used more flour to thicken the juices, but it was a mighty fine bit of heaven with Vital Greens thick and lovely 52% cream on top. Ooooh – baby! I was delighted that this pie did not overflow. It looks almost clafoutis-like, but was definitely a tasty pie very different than the traditional one. I prefer the traditional, but many prefer a custard pie base and who doesn’t enjoy change? 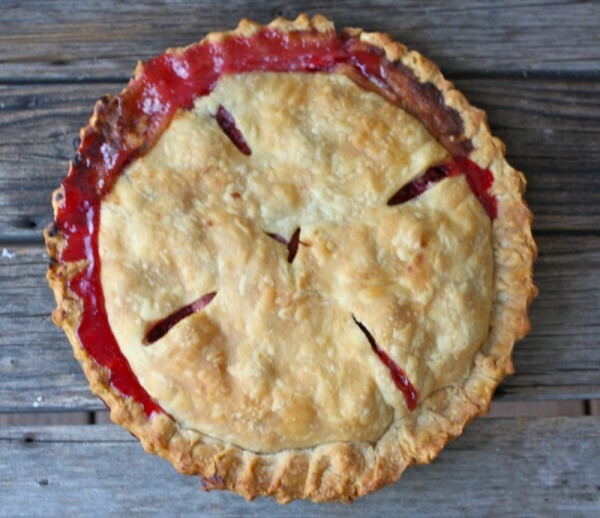 So nice to have TWO cherry pies! 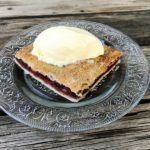 Note: I always line the bottom of the oven with foil, or parchment or a cookie sheet to catch drippings; this pie is still tart but pairs beautifully with vanilla ice cream. Lovely. That was an abundant tree. 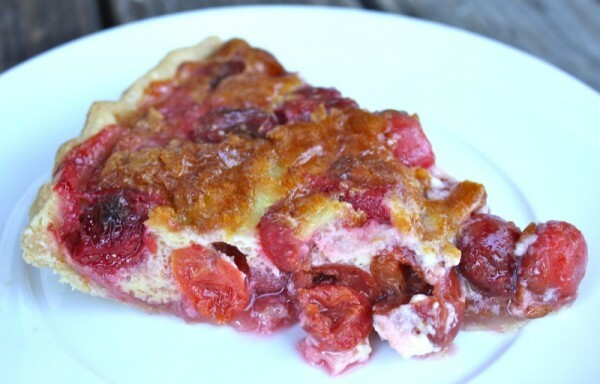 Love your idea of cherry custard pie. 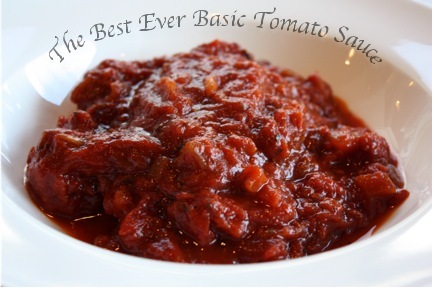 Will you be posting the Evan’s Cherry Walnut Citrus Chutney Recipe from your Aug 15th posting? 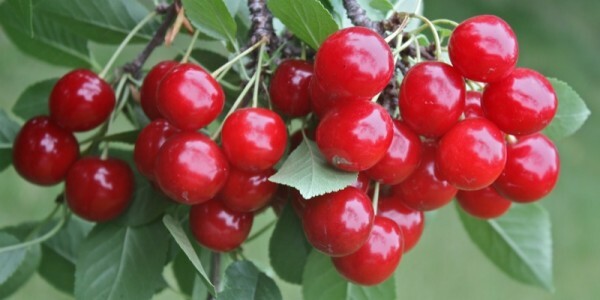 Have enjoyed the wonderful pictures of all those beautiful sour cherries. I will be posting it as soon as I make it which should be this week! I will do that one right now! Rather, it is done! 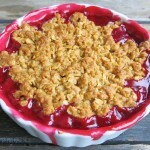 The cherry custard pie intrigues me. 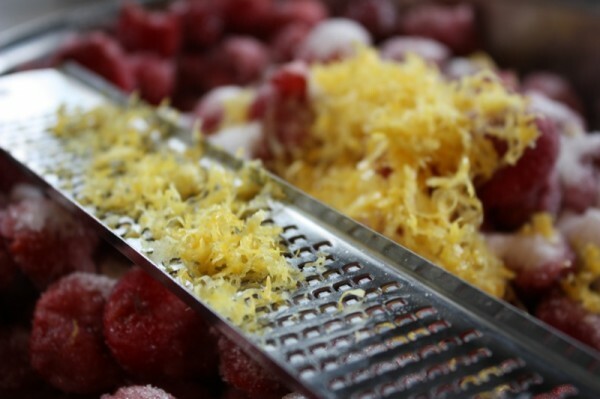 I remember when we used to pick cherries back in Milton the farm had a cherry pitting machine from the 1800’s. 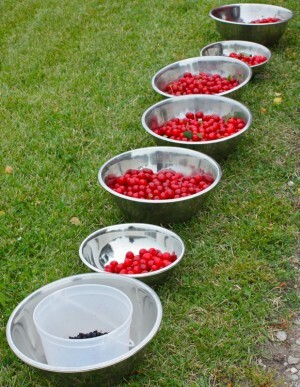 All your buckets and buckts of cherries would be potted within minutes. Holy Cow! That would have been THE machine to have – though the hours of pitting and visiting and laughing are part of it all… kind of like shelling peas used to be. Gorgeous cherries. The ones I get are usually either red and yellow, or a dark garnet. I like the bright red. The Evan’s Cherry is the brightest almost dark dark orange-red candy apple red you will ever fine. Incredibly brilliant – almost fluorescent! 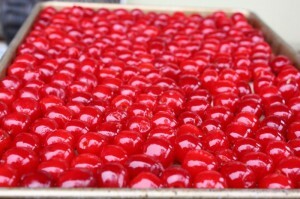 Cherries are by far my favorite fruit and so is cherry pie, especially sour cherry pie. Can you please send me one? 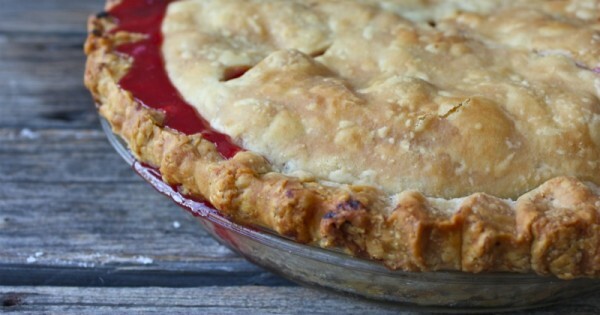 wow that pie looks irresistable! i am drooling over it right now. Wow..how fortunate of you to have neighbors like Jan, Valerie! Can you please call me to your house for a summer vacation 🙂 Have never seen a cheery tree..lovely..lovely.. I can completely relate! I had never seen a cherry tree until the last few years myself, and I have never seen any other kind of cherry tree, either. When they are ready in British Columbia, I have never been out there – and that is so close to us in Alberta. So, this was very thrilling for me for that reason, too! A slice of each for me please! I had an offer to strip a friend’s sour cherry tree here, but I was in Toronto and missed it! So, vicariously enjoying your pies instead. Have a wonderful day! 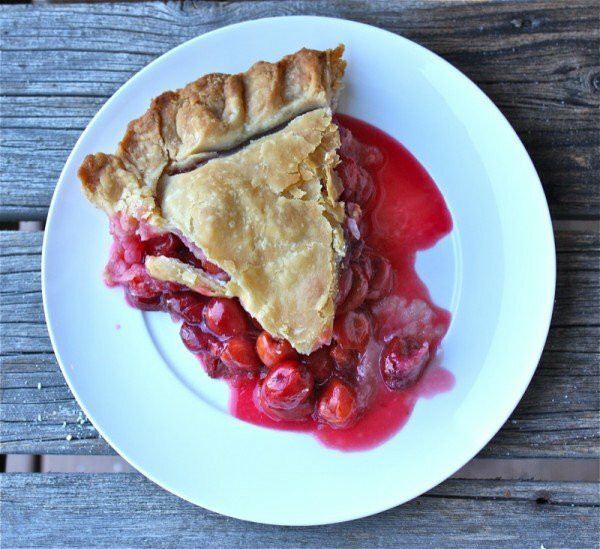 Gorgeous pies and photos and great info on Evans Cherries. After two years of operating Fruit Share in Winnipeg (similar to Edmonton’s OFRE)I realized that too many people don’t know what amazing fruit we have in the prairies and/or what to do with it. 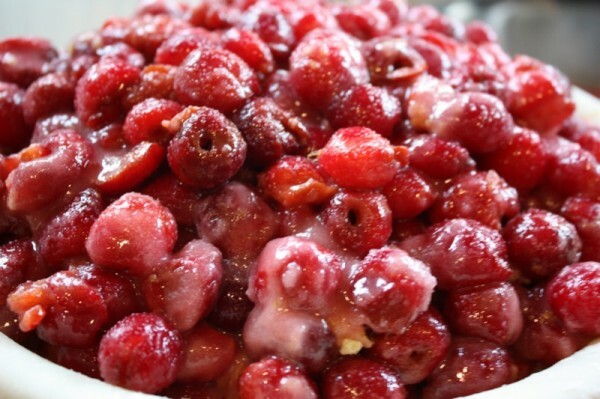 As a result, I decided to write a guide/recipe book on Prairie Fruit. 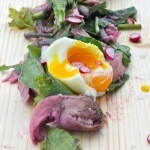 The book should be ready for Spring 2012 – just a few more recipes to go! 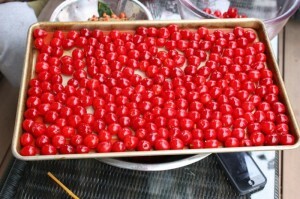 I wondered if you would be interested in sharing your cherry recipe(s) and photos for inclusion in the book? I can’t offer any financial incentive, but you would get credit for any work in the book. If you’d like to learn more or have any questions, please email me. In the meantime, I’ll just enjoy your beautiful, tasty work. What a lovely offer. I will write to you in private about this. 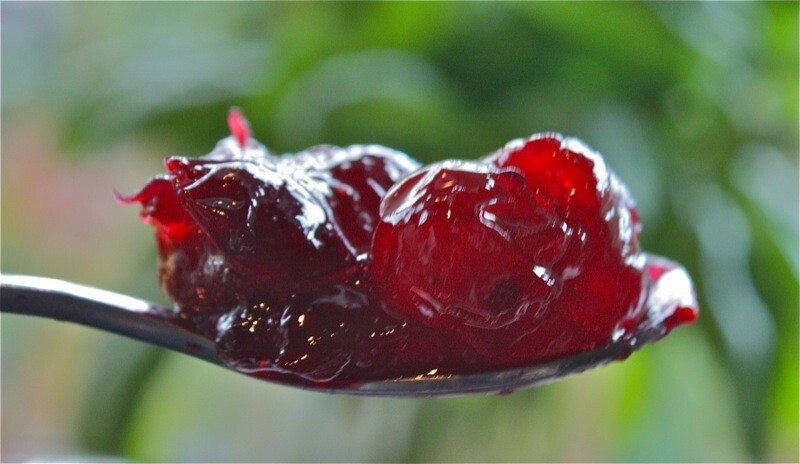 You are my “go to” site for things like – what to do with the gift of Evans cherries that I just received? And to read about using a straw as a pitter – wonderful advice! I’m about to head off to purchase the heavy cream for the custard version…and some good vanilla ice cream. I hope that Planet Organic has the vital greens 52% cream – call Blush Lane they also carry it as does the grocery store at the enjoy center – but that is FAR from you! Can’t wait to hear how your yumminess turns out. Making an upside down pear gingerbread cake for tonight… love home food. I’d never heard of an Evans cherry, so looked it up. Naturally dwarf, as well as amazingly cold hardy. 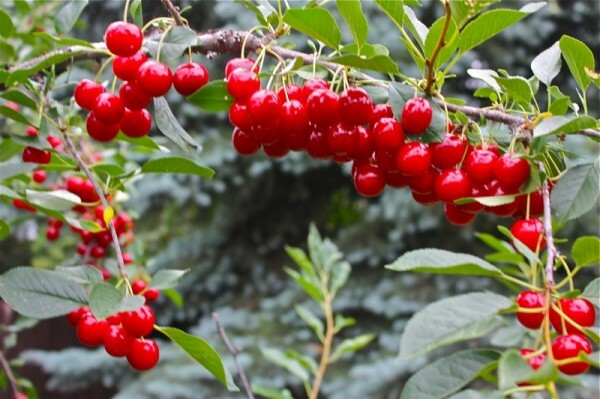 The story of Prairies cherries makes for a good read fashttp://www.fruit.usask.ca/articles/cherries.pdf. Your posts often lead me to interesting discoveries. I love looking at your delicious photos of fabulous fruit, even if they are things I’m unlikely to ever taste. Thank you! I have a detailed post on them, too. Surprised it didn’t show up in your search. 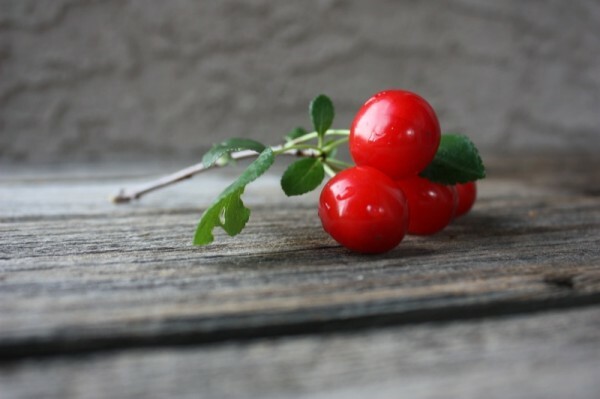 Think sour cherry and I am sure you have access – in Italian specialty stores, for sure. But, I grow them in my backyard and also have a post on how I preserve them. So fabulous. I am very certain that there are many delicious foods you have that I don’t. That is why I love to travel – well – one of the reasons. 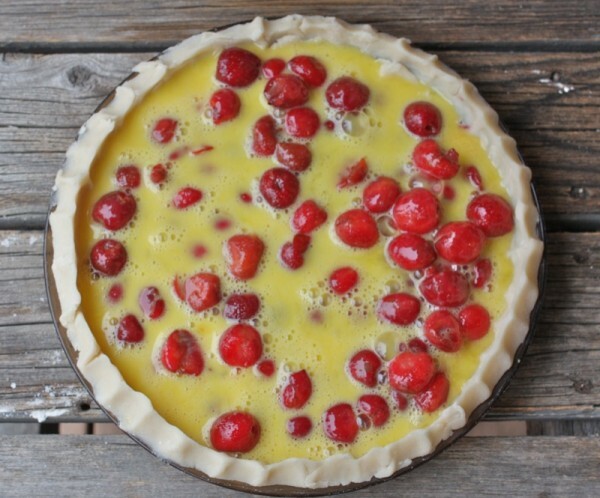 I’m in the process of cooking the cherry custard pie. I think you’re cooking times are off. I followed the instructions and it is still completely liquid on the inside. 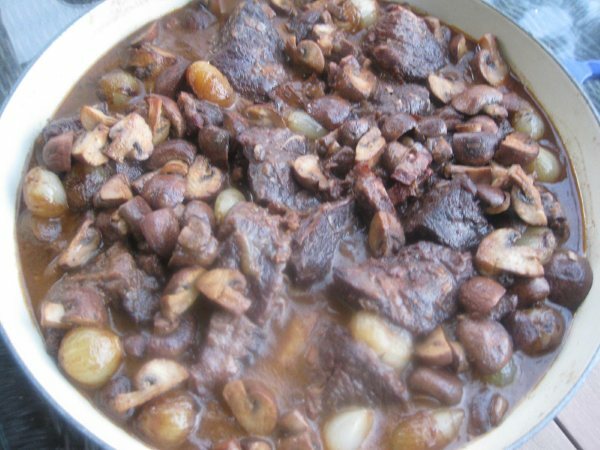 I did a quick google search and hopefully I can get it fully cooked without ruining it. The cooking time and oven temperature were right on for my oven, and I find my instructions pretty congruent with the ovens of most of my readers. Did you use large eggs? Did you bake 15 minutes at 450 and reduce to 350 for remaining 30 minutes? My slice is not a thick clean slice, but a nice custard pie with a delicious flavour. 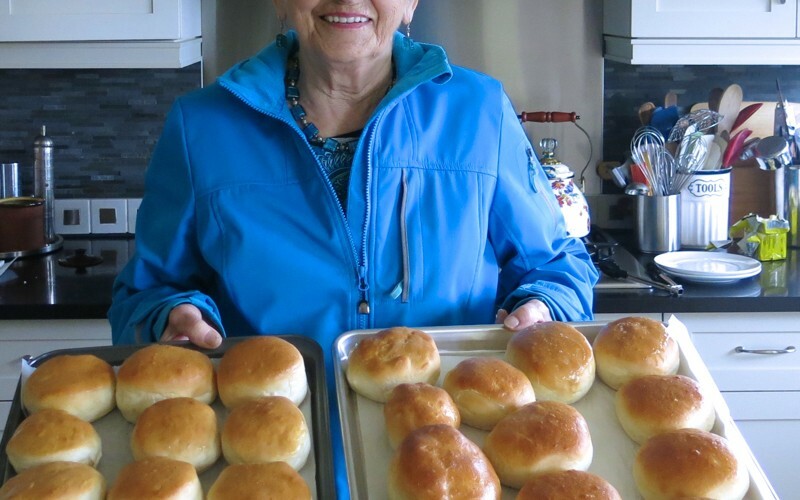 I’ve made it a lot as it’s my grandmother’s recipe. I am so sorry the baking experience was stressful for you. How did it go in the end? I am surprised that you say when you googled times for custard pies you found times that varied considerably from my times. That makes me question the size of the pies. Anyway, am always curious and do what I do to share what I love and what works for me. Usually, it works just as well for others, too. 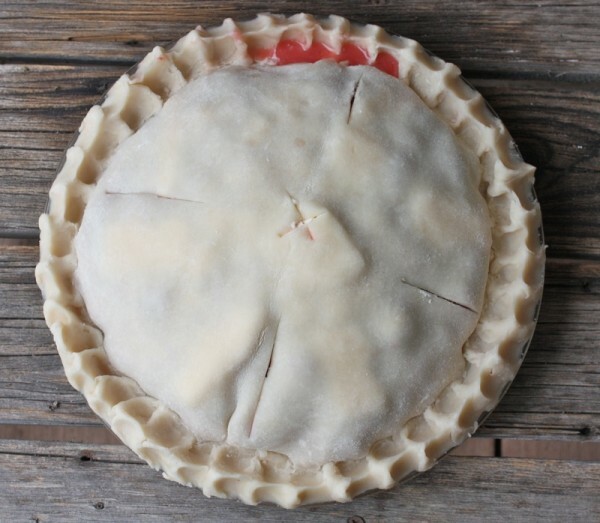 Interestingly, and rarely, I just reread all comments and no one here has commented about how their pie turned out. Only one person mentioned she was making it. 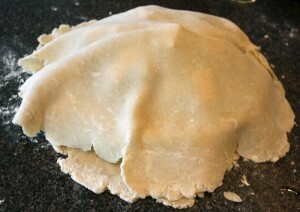 I do know many of my friends have done so, successfully – but let’s work on your pie coming out well!